このドキュメントでは、サンプル アプリを実行することで、Elastic Database クライアント ライブラリの開発を体験できます。This document introduces you to the developer experience for the elastic database client library by helping you run a sample app. サンプル アプリでは単純なシャーディング アプリケーションを作成し、Azure SQL Database の Elastic Database ツールの主な機能について詳しく見て行きます。The sample app creates a simple sharded application and explores key capabilities of the Elastic Database Tools feature of Azure SQL Database. また、シャード マップの管理、データ依存ルーティング、マルチシャード クエリのユース ケースに重点を置いています。It focuses on use cases for shard map management, data-dependent routing, and multi-shard querying. このクライアント ライブラリは .NET と Java で使用できます。The client library is available for .NET as well as Java. クライアント ライブラリとサンプル アプリを含む GitHub リポジトリを複製します。Clone the GitHub repository containing the client library, along with the sample app. クライアント ライブラリの機能をより深く知るには、さまざまなオプションを試してみてください。To learn more about the client library capabilities, experiment with the various options. サンプル アプリの実装の詳細を知るために、コードの詳細を確認することができます。Feel free to explore the code to learn about the sample app implementation. お疲れさまでした。Congratulations! これで、Azure SQL Database で Elastic Database ツールを使って、最初のシャーディング アプリケーションを適切にビルドし、実行できました。You have successfully built and run your first sharded application by using Elastic Database Tools on Azure SQL Database. Visual Studio または SQL Server Management Studio を使用して SQL Database に接続し、サンプルで作成したシャードの内容を簡単に確認してください。Use Visual Studio or SQL Server Management Studio to connect to your SQL database and take a quick look at the shards that the sample created. 新しいサンプル シャード データベースと、シャード マップ マネージャー データベースがサンプルで作成されていることがわかります。You will notice new sample shard databases and a shard map manager database that the sample has created. Visual Studio 2012 以降 (C#)。Visual Studio 2012 or later with C#. 「 Visual Studio のダウンロード」で無償評価版をダウンロードしてください。Download a free version at Visual Studio Downloads. NuGet 2.7 以降。NuGet 2.7 or later. 最新版を入手するには、「Installing NuGet(NuGet のインストール)」をご覧ください。To get the latest version, see Installing NuGet. ライブラリをインストールするには、 Microsoft.Azure.SqlDatabase.ElasticScale.Clientに移動します。To install the library, go to Microsoft.Azure.SqlDatabase.ElasticScale.Client. ライブラリは、次のセクションで説明するサンプル アプリと共にインストールされます。The library is installed with the sample app that's described in the following section. Elastic DB Tools for Azure SQL - Getting Started のサンプルを MSDN からダウンロードします。Download the Elastic DB Tools for Azure SQL - Getting Started sample from MSDN. 任意の場所にサンプルを解凍します。Unzip the sample to a location that you choose. 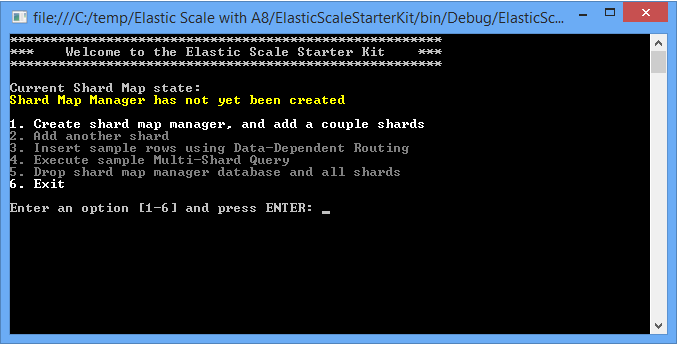 ElasticScaleStarterKit.sln ソリューションを C# ディレクトリから開いてプロジェクトを作成します。To create a project, open the ElasticScaleStarterKit.sln solution from the C# directory. サンプル プロジェクトのソリューションで、app.config ファイルを開きます。In the solution for the sample project, open the app.config file. ファイルの指示に従って、使う Azure SQL Database サーバーの名前とサインイン情報 (ユーザー名とパスワード) を追加します。Then follow the instructions in the file to add your Azure SQL Database server name and your sign-in information (username and password). アプリケーションをビルドし、実行します。Build and run the application. メッセージが表示されたら、Visual Studio によるソリューションの NuGet パッケージの復元を有効にします。When you are prompted, enable Visual Studio to restore the NuGet packages of the solution. これにより、Elastic Database クライアント ライブラリの最新版が NuGet からダウンロードされます。This action downloads the latest version of the elastic database client library from NuGet. クライアント ライブラリの機能をより深く知るには、さまざまなオプションを試してみてください。To learn more about the client library capabilities, experiment with the various options. アプリケーションで実行されたステップはコンソールに出力されるので、動作していたコードをじっくりと検討することができます。Note the steps that the application takes in the console output, and feel free to explore the code behind the scenes. お疲れさまでした。Congratulations! これで、SQL Database で Elastic Database ツールを使って、最初のシャーディング アプリケーションを適切にビルドし、実行できました。You have successfully built and run your first sharded application by using Elastic Database Tools on SQL Database. Visual Studio または SQL Server Management Studio を使用して SQL Database に接続し、サンプルで作成したシャードの内容を簡単に確認してください。Use Visual Studio or SQL Server Management Studio to connect to your SQL database and take a quick look at the shards that the sample created. 新しいサンプル シャード データベースと、シャード マップ マネージャー データベースがサンプルで作成されていることがわかります。You will notice new sample shard databases and a shard map manager database that the sample has created. 最新バージョンの Management Studio を常に使用して、Azure と SQL Database の更新プログラムとの同期を維持することをお勧めします。We recommend that you always use the latest version of Management Studio so that you stay synchronized with updates to Azure and SQL Database. SQL Server Management Studio を更新します。Update SQL Server Management Studio. シャードとシャード マップの管理:このコードは、シャード、範囲、マッピングが ShardManagementUtils.cs ファイルでどのように機能するかを示します。Managing shards and shard maps: The code illustrates how to work with shards, ranges, and mappings in the ShardManagementUtils.cs file. 詳細については、「シャード マップ マネージャーでデータベースをスケールアウトする」をご覧ください。For more information, see Scale out databases with the shard map manager. データ依存ルーティング:トランザクションの適切なシャードへのルーティングは、DataDependentRoutingSample.cs ファイルに示されます。Data-dependent routing: Routing of transactions to the right shard is shown in the DataDependentRoutingSample.cs file. 詳細については、「データ依存ルーティング」をご覧ください。For more information, see Data-dependent routing. 複数のシャードにまたがるクエリ実行:複数のシャードに対するクエリの実行は、MultiShardQuerySample.cs ファイルに示されます。Querying over multiple shards: Querying across shards is illustrated in the MultiShardQuerySample.cs file. 詳細については、「マルチシャード クエリ実行」をご覧ください。For more information, see Multi-shard querying. 空のシャードの追加:新しい空のシャードの反復追加は、CreateShardSample.cs ファイルのコードによって実行されます。Adding empty shards: The iterative adding of new empty shards is performed by the code in the CreateShardSample.cs file. 詳細については、「シャード マップ マネージャーでデータベースをスケールアウトする」をご覧ください。For more information, see Scale out databases with the shard map manager. 既存のシャードの分割:シャードを分割する機能は、分割/マージ ツールで提供されます。Splitting an existing shard: The capability to split shards is provided by the split-merge tool. 詳細については、「スケールアウトされたクラウド データベース間のデータ移動」をご覧ください。For more information, see Moving data between scaled-out cloud databases. 既存のシャードのマージ:シャードのマージも分割/マージ ツールを使って行われます。Merging existing shards: Shard merges are also performed by using the split-merge tool. 詳細については、「スケールアウトされたクラウド データベース間のデータ移動」をご覧ください。For more information, see Moving data between scaled-out cloud databases. 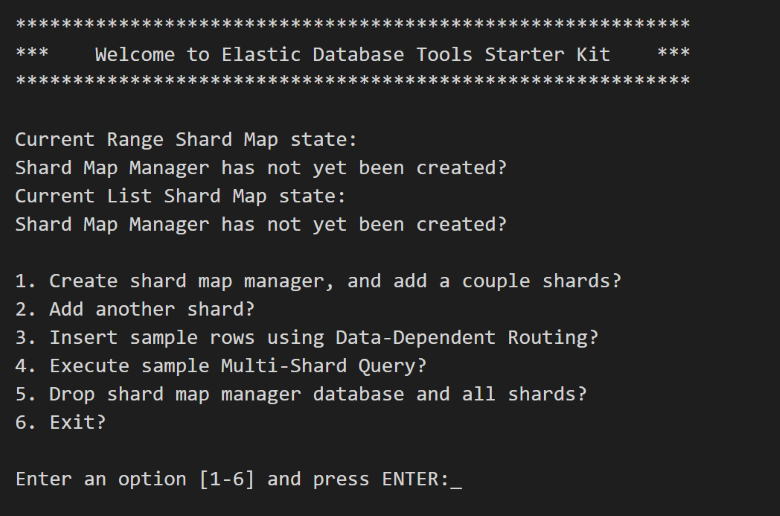 Elastic Database ツール ライブラリは無料です。The Elastic Database Tools library is free. Elastic Database ツールを使っても、Azure の利用料以外の追加料金は発生しません。When you use Elastic Database Tools, you incur no additional charges beyond the cost of your Azure usage. たとえば、サンプル アプリケーションは新しいデータベースを作成します。For example, the sample application creates new databases. この機能のコストは、選んだ SQL Database のエディションと、アプリケーションによる Azure の使用状況に応じて異なります。The cost of this capability depends on the SQL Database edition you choose and the Azure usage of your application. 料金情報については、「SQL Database の価格」をご覧ください。For pricing information, see SQL Database pricing details.